Crime scene investigators are the foundation for every criminal investigation. The admissibility and persuasiveness of evidence in court, and in turn, the success of a case, is largely dependent upon the evidence being properly collected, recorded, and handled for future analysis by investigators and forensic analysts in the lab. 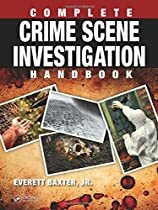 Complete Crime Scene Investigation Handbook is the most complete, one-stop practical reference for law enforcement and crime scene professionals as well as students looking to enter the field. A special considerations section reviews topics such as shooting scene and bloodstain documentation, clandestine graves and scattered human remains, fire scenes, and questioned document evidence. The final chapters examine how to develop a working plan and processing methodology as well as effective report writing. This book is a must-have reference for experienced forensic, crime scene, and investigative professionals as well as students in forensic science programs looking to enter the field. A specially developed companion lab exercise workbookโ€•The Complete Crime Scene Investigation Workbook (ISBN: 978-1-4987-0142-6)โ€•is also available for purchase and can be used in conjunction with this handbook, both for group training purposes or for individuals looking for hands-on self-study.